The other day, I was watching a rerun of the 1960s TV series, I Dream of Jeannie. The font the producers used in the opening credits really caught my eye, and I wondered if there was a Website that would make it easy to find it and other fonts that were used in old TV shows and movies. A quick Google search for “I Dream of Jeannie font” pointed me to the Famous Fonts Website. Eureka! 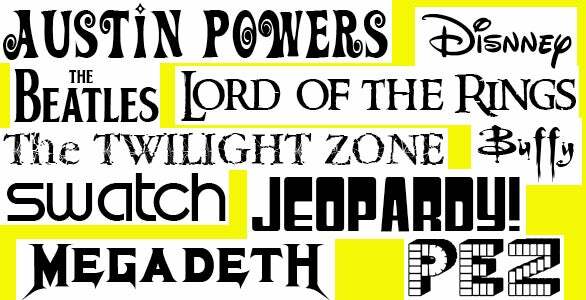 This site lists more than 300 fonts used in titles for TV shows, movies, and record albums, as well as logo fonts for bands, food and drink products, publications, games, cars, sports teams, companies and organizations, and more. However, I was concerned about the legality of using these fonts, as well as their quality. If you need a font for a commercial project, it’s best to use fonts purchased from a commercial foundry because you can use them legally on any project. Fortunately, the commercial fonts on the Famous Fonts Website are identified as such, and accompanied by links that let you purchase the font from its developer. But what can you do if the font you want is not available as a commercial font—only as a free one? Helpfully, each free font on the Famous Fonts Website has a Read Me file that lists the font’s designer, details about the font, and the conditions under which you are legally allowed to use it. This little text file is useful because showcasing a font that has no identifiable source could put you in legal hot water. Unfortunately, you must download and uncompress each font file that interests you before you can access its Read Me file. Another Website, FontSpace, has 187 free fonts, each labeled according to its legal use. Most of the fonts are listed as “personal use only,” which means you are free to use them on personal projects such as posters, invitations, and so on, while the ones labeled “commercial use friendly” may be used in any project. In general, most fonts worth having are not free. Why? Some free fonts have inconsistent details, rough edges, bad letter spacing, and possibly even technical glitches that prevent them from printing. In contrast, commercial fonts are created by skilled designers who work hard to craft and meticulously perfect each letter shape. Designers also determine the optimal spacing between all the important letter pairs as well as the codes that generate important font information. Free fonts often lack these important details. I’ve found that many free fonts whose designers are proud enough to attach their name and comments to them are of better quality than fonts from unidentified designers. I had lots of fun flipping through the free fonts, as well as the commercial offerings. I’m sure you’ll find some of your own favorites as you browse them, too.